These days, a lot of videos are distributed by streaming, which requires a persistent internet connection to view them. However, the internet doesn’t always come with us. Sometimes you may want to download your favorite videos for later watching on a device. How to do it? You can simply go through the Internet and search for a video downloader. Well, there are hundreds of video downloader applications to save online videos for Windows Platforms. While for Mac users, there are few options to choose from. Don’t worry. Here we have listed the best 7 video downloader applications for Mac, which will do the job for you as well as what you can find on Windows PC. Just check out them and pick up the best one according to your need. All these applications works well on macOS Mojave, High Sierra, Sierra, and OS X EI Capitan, Yosemite, Mavericks, Mountain Lion, Lion, Snow Leopard. 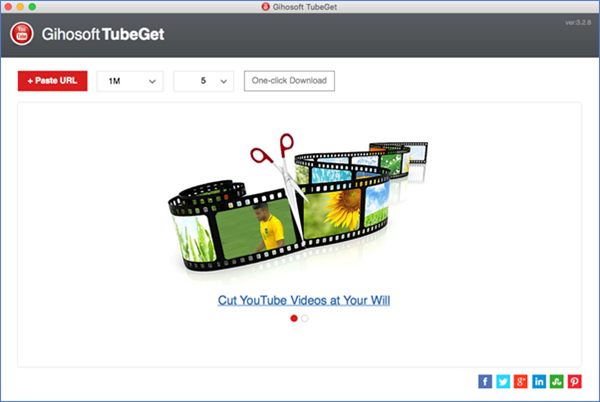 Gihosoft TubeGet for Mac is the number one in this list, which is specifically developed for YouTube video downloader. It can download YouTube videos on Mac as well as other 1000+ popular video hosting websites such as Facebook, Twitter, Instagram, Tumblr, Vimeo, Dailymotion and more. The program is not limited to video downloading, but also supports playlist, channels and extracts MP3 tracks from videos. Besides, the app can also download subtitles and save in .srt format. To download videos on Mac with TubeGet, you’ll just need to paste the video URL, select video quality and then click Download. 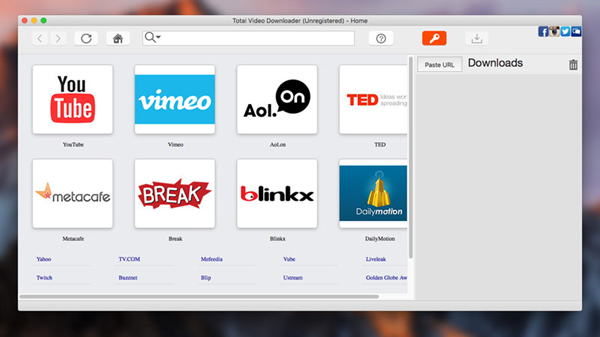 Freemake Video Downloader for Mac can download videos from YouTube and 10,000 other sites, including Facebook, Vimeo, Dailymotion, Twitch, LiveLeak, Veoh, Local, and more. You can freely choose video quality and format like MP4, WebM, 3GP, FLV, etc. The application provides you one-click mode feature. You can simply set the resolution you want and the location where you want to save the videos, then it will automatically download multiple videos according the settings you made. If your internet connection is slow, you can also limit the download speed as you need. YTD Video Downloader for Mac is one of the best application for Mac users to download videos from YouTube for watching offline. With the built-in converter in this free video downloader for Mac, you can convert your downloaded videos to other common formats like MP4, MP3, WMV, FLV, MOV, 3GP, AVI, as well as presets to fit many portable devices such as iPhone, iPad, Android, Samsung Galaxy, HTC, Kindle Fire and many others. If you don’t want to download single videos one by one, it has an batch mode which lets you download multiple videos at the same time. The application provides an easy-to-understand interface and some extra options that make it very handy. 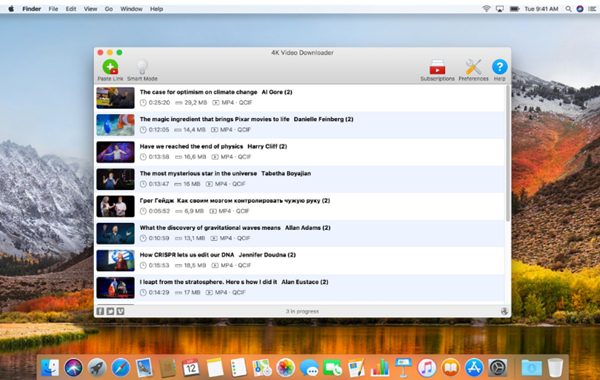 VideoDuke is an advanced video downloader for Mac, which can be the best in the list to download streaming videos on Mac at a pleasant fast speed and with great quality. With VideoDuke, you can download videos from YouTube, Vimeo, Dailymotion and save them in popular formats like 3GP, MP4, M4V, FLV, AVI, MOV, MKV, etc. You are allowed to select quality for each video, such as 360p, HD 720p, HD 1080p, 4K or other resolution. This Mac video downloader also allows you download YouTube videos as audio files and save them as WebM, MP3 or other available audio formats. What’s more, you can search for videos directly from the app and bookmark your favorite web pages for quick access. 4K Video Downloader for Mac allows you to download videos, playlists, channels and subtitles from different video sites like YouTube, Facebook, Vimeo, SoundCloud, Tumblr, Flickr, etc. in high quality. With this application, you can download and save videos in various formats, such as MP4, MKV, M4A, MP3, FLV, 3GP, and more. Besides, you have the option to download the best video resolution according to your need, e.g. HD 720p, HD 1080p, 4K and even 8K resolution. The program comes with simple and straightforward interface for its users to download videos on Mac easily and faster. Just copy the video link from your browser and click “Paste Link” in the application. 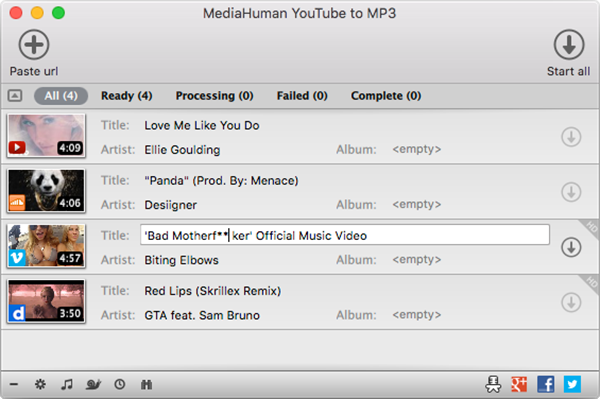 If you want to download movies and music from YouTube to Mac for offline playing, we recommend you to try out MediaHuman YouTube to MP3 Converter for Mac. This application serves you multiple features. You can easily download all music from YouTube playlist or channel with highest quality up to 320 kbps. Not only YouTube, the program also supports Vevo, Vimeo, Dailymotion, Soundcloud, Bandcamp, MixCloud, and many others. Besides, it provides you the option to add downloaded tracks into iTunes automatically. This application provides amazing and clean interface to its users to work faster and smoother. Just copy an URL into the clipboard and it will be added to the download queue. Total Video Downloader for Mac is the simplest and fastest video downloader for Mac device. With this professional software, you can download videos of any format on your Mac, like MP4, AVI, FLV, 3GP, Webm, etc. What’s more, you can always use this powerful tool to download videos from a large number of video hosting sites such as YouTube, Vimeo, Dailymotion, Facebook, Twitter, Livestream and more on your Mac. 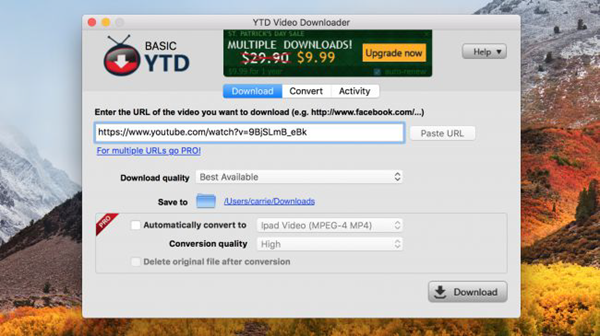 The video downloader is especially designed for Mac users and really easy to use. You just need to copy & paste the video link which will automatically pop up the download box. For choosing the best video downloader for Mac OS, we should comply with some parameters, such as the number of supported sites, ability to choose format and video quality, audio extracting, download speed, etc. Here we have listed the best 7 video downloader applications for your Mac computer. Just pick up your favorite one according to your need and let use know about your choice in the comment section. If you are on a Windows PC, please check out the 5 Best Ways to Download Entire YouTube Playlist in One Click. Or if you don’t want to install any additional software on your computer, just try out the Top 10 Best Free YouTube Downloader Online.